in the Legislative Assembly of Assiniboia by Hon. Hugh Francis Olone and Hon. Alfred H. Scott. The latter elected representative was also delegated to negotiate the terms of confederating with Canada at Ottawa (along with Rev. Nöel-Joseph Ritchot and Judge John Black). Alexander Jamieson Russell, illustration, “Town of Winnipeg,” Canadian Illustrated News 1 (Saturday, 18 December 1869), 101, the view from the North Gate of Upper Fort Garry, showing the Canadian Party flag flying in front of Schultz’s drugstore and boarding house (the large two-storey building depicted on the right). See also Alex. J. Russell, The Red River Country, Hudson’s Bay & North-West Territories considered in relation to Canada (Montreal: G. E. Desbarats, 1870), 8-9. On or about 11-12 February 1870, Alfred H. Scott and Hugh Francis Olone circulated a petition in the town asking for representation in the Legislative Assembly of the Provisional Government (recently established by vote of The Convention of Forty/ La Grande Convention). They wanted Winnipeg to be made a constituency separate from the parish of St. John’s. On or about 12 February Scott and Olone presented their petition to President Louis Riel (also appointed by the Convention, and now in charge of governance, along with his executive council). By 2 March 1870, Scott and Olone’s requested change had been approved by the President and Council. The plan previously devised during the The Convention of Forty, calling for a legislative assembly of twenty-four elected representatives, was therefore modified. Two additional councillors were to be elected to represent Winnipeg. But, increasing the number of electoral ridings in the settlement by one and bringing the total number of representatives up to twenty-six would mean that the legislative assembly would have fourteen nominally ‘English’ councillors and only twelve who were nominally ‘French.’ The problem was addressed and balance maintained by allowing for two additional councillors from the French parishes. Thus the number of members required for the legislative assembly was finalized at a total of twenty-eight. The New Nation dated 4 March 1870 (but apparently printed on the 5th) carried a notice that the Provisional Government had officially designated Winnipeg to be the capital of the North-west. “Official Orders,” New Nation (4 March 1870), 2. The boundaries of the town were now defined by “The Assiniboine River on the South; Red River on the East; McDermott’s Creek on the North; and on the West by Spence’s Creek.” The latter western boundary was also known as Colony Creek and ran beside James Spence’s gristmill. The placement of the southern boundary meant servants of the Hudson’s Bay Company who maintained households in Upper Fort Garry were included within the Winnipeg riding as constituents with representation in the legislative assembly of the Provisional Government (which would be named the Legislative Assembly of Assiniboia on 18 March 1870). The placement of the northern boundary meant that the people residing to the north of McDermott’s creek (running between lots that had originally belonged to Andrew McDermott and James Sinclair), most of whom lived in Point Douglas, which previously had fallen within the boundaries of the Winnipeg riding, were now counted as constituents of the riding known as St. John’s Parish. 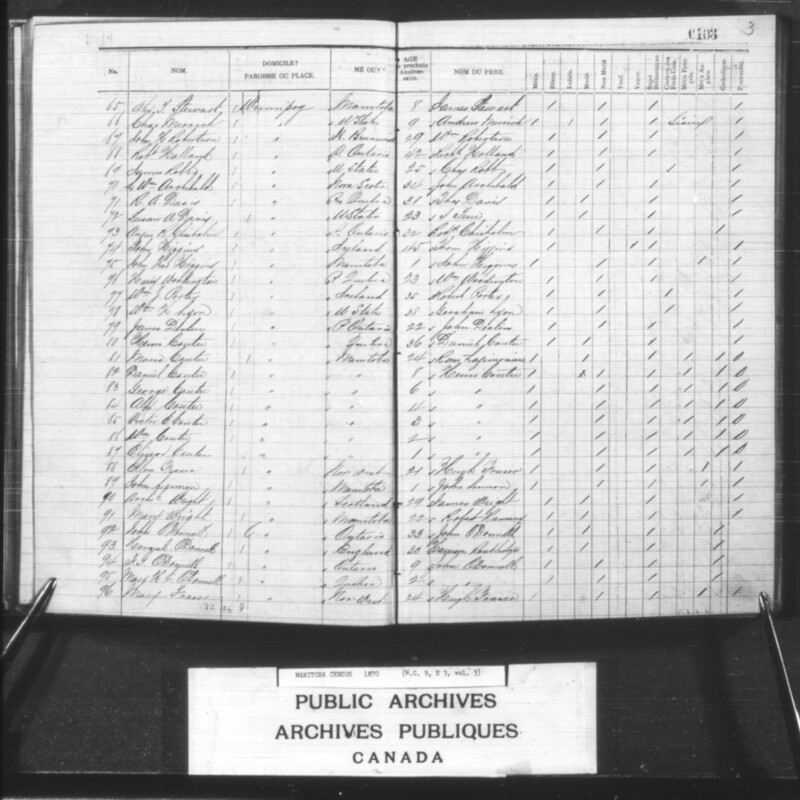 For the Archibald Census of 1870 the northern Winnipeg boundary reverted, so that people of Point Douglas were once again listed as residents of Winnipeg, not St. John’s. In addition, by the time the census was taken in October a number of people — whether associated with the Provisional Government or opposed to it — had left the new province of Manitoba so were not counted as having resided there on 15 July 1870. 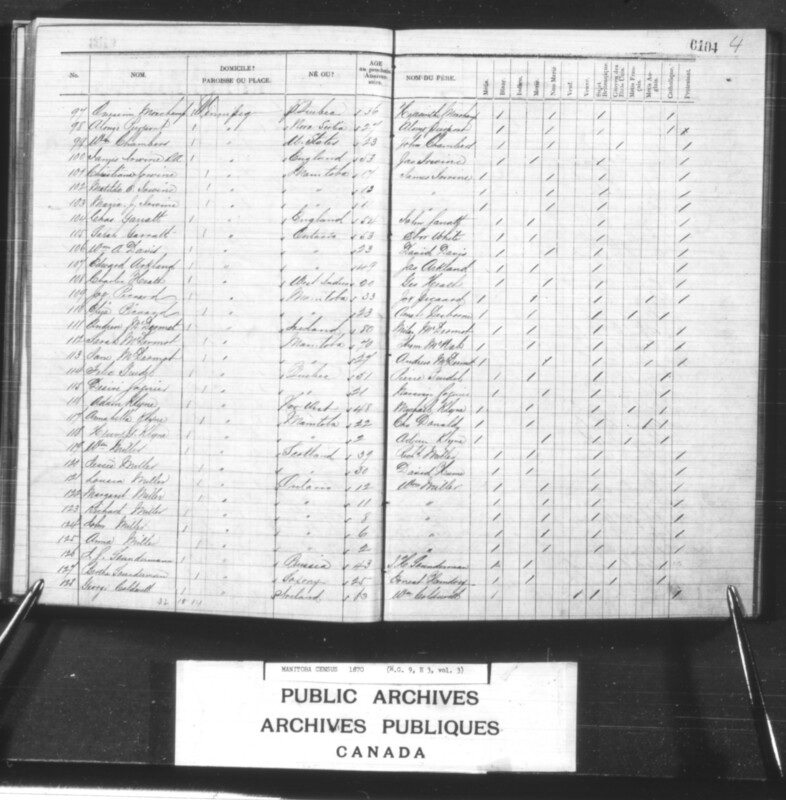 The first list below, based on the census, therefore represents an initial ‘best guess’ reconstruction of the ‘householder’ population of the Town of Winnipeg during the Resistance. William James Topley, photograph, “Winnipeg 1871,” (1871). At the time, Archibald considered the First Nations as sovereign. Until they agreed to enter a treaty with Canada, their lands could not be counted as co-extensive with the Red River Settlement or as available for settlement by outsiders (though newcomer Canadians had staked claims on unceded lands as early as 1868). The Selkirk Treaty of 1817 had covered the land adjacent to The Forks where Winnipeg and Upper Fort Garry stood, but First Nations considered this to be more like a concession granted to settle on land to which they still held title — not a complete give-away. Treaty 1 of 1870 re-addressed the issue of First Nations title. The Fort Garry Band — principally Anishinaabe people who inhabited that area, but as well had connections south to the international boundary and north to the Brokenhead settlement — were signatory to that treaty, under the leadership of Na-sha-ke-penais. 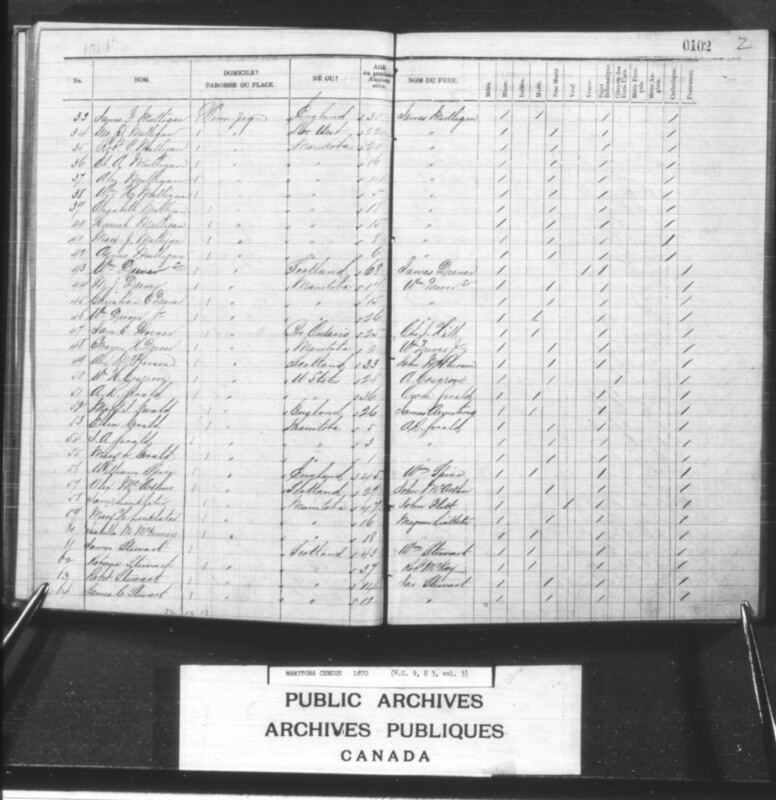 Some of the Band member names were recorded in the Treaty 1 Paysheet of 1875 (in most instances, however, only the male head of a family is named — wives and children are mainly anonymous). 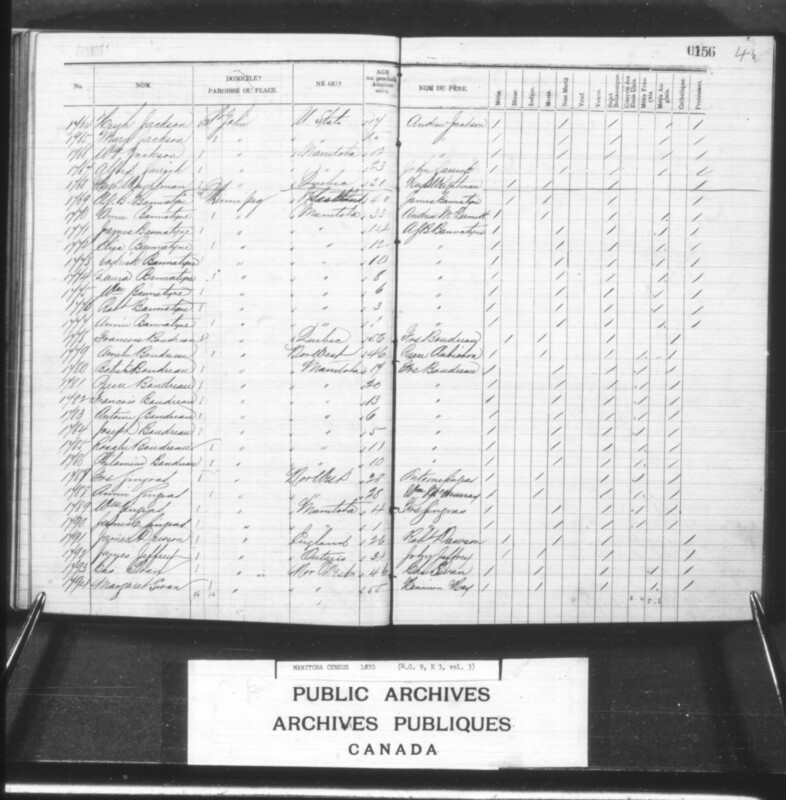 The names are included below under a separate heading, to give an indication of the number of First Nations people who counted Upper Fort Garry and environs as home [The 1875 paysheet is used because that is the earliest I have managed to locate online. See also Pointe Coupée for names associated with the Pembina Band]). Harriet lived with her husband and youngest child inside the fort during the Resistance of 1869-1870, while the older children were away at school in England. – James William 9, Mary Letitia 8, Florence Anne 8, Andrew Dugald 4. Nephew of the HBC Governor and first lady at Upper Fort Garry. – Margaret Marie ‘Maggie’ 5, George Taché 3. J.H. McTavish was unrelated to the HBC Governor and first lady at Upper Fort Garry — though two of their children eventually married; Sophia’s sister, Margaret Rowand, was married to Hon. James McKay, St. James, of the legislative Assembly of Assiniboia. Arrived January 1870; departed August 1870. Appointed Col.-Commandant of the Provisional Government of Assiniboia’s military force. See The Military/ Settlement Guard. George Emmerling arrived at Red River c.1862 by way of the U.S.; proprietor of Emmerling’s Hotel. Emilie Mager was the sister of Victor Mager. The Emmerlings either lived across the river in St. Boniface Parish, or appear sold their hotel and moved across the river to St. Boniface sometime in the spring to autumn of 1870. – Augustus Joseph 24 married Catherine/ Nancy Settee (Métis, born 1857 to #2917 Rev. James Settee and Sarah Cook); Lucy 23 married Linus Romulus Bently; #3419 John 21 [married  Isabella Linklater (born 1847 to #2969 Magnus Linklater and Jane Flett)]; George 19; Jessie 15. Proprietors of a general goods store. Henry McKenney was a half-brother of John Christian Schultz (below). R.H. McLaughlin (Usonian, born to Robert McLaughlin and an unidentified woman). Proprietor of a photography studio and gallery; possibly an in-law of Hon. Hugh Francis ‘Bob’ Olone. Hon. Hugh Francis ‘Bob’ Olone (Usonian, born 1836 to James Olone and Margaret). Importer of liquor and tobacco products; proprietor of Olone’s Saloon; founding member of the town’s first fire brigade. May have worked at, or lived at, Hugh Francis ‘Bob’ Olone’s Saloon. Reputed to be a ‘character’ and cantankerous; arrived at Red River from Fort Edmonton c.1866 with Father Albert Lacombe. See St. Vincent Memories http://56755.blogspot.ca/2011/03/troop-socials.html. Supporter of annexation of Rupert’s Land to the U.S.; resigned in March when recalled to Washington D.C. to be made United States Consul for Pictou, Nova Scotia (1870 to 1881). – George H. Young 20. [4-5] John Christian Schultz (Upper Canadian, born 1839 to William Ludwig Schultz and Elizabeth Reily/ Riley McKenney) married Agnes Campbell Farquharson (Scottish, born c.1840 to James Farquharson and an unidentified woman; RC). The Schultzs ran a drugstore and boarding house; John C. Schultz claimed to be a medical doctor, but was not certified or licensed; he was one of the leaders of the Canadian Party. Printer and Canadian Party member. Arrived in the autumn of 1869. Printed 300 copies of William McDougall’s bogus proclamation by the “planer process.” Apparently afterwards fled the settlement, returning with Wolsely’s Red River Expeditionary Force. See J.C. Major, “Introduction,” The Red River Expedition (1870). The Donaldson’s operated a “Book; Stationery, Fancy and Toy line of business,” along with running a lending library. Hugh was appointed captain in the Patriot Army/ Red River Cavalry of the Provisional Government in response to rumours circulating by late November 1869 that ‘the Sioux’ posed a threat to the settlement. See “The Sioux! Winnipeg in Arms! The First Appearance of the Canadian Allies,” New Nation(7 January 1870), 2. Margaret Harriott’s first husband ( John Rowand Jr., deceased) was brother to Sophia Rowand McTavish who lived at Upper Fort Garry, and brother to Margaret Rowand McKay married to Hon. James McKay, St. James of the Legislative Assembly of Assiniboia. Appointed 2d Lieutenant in the Provisional Government of Assiniboia’s settlement guard in late November; publisher and editor of the New Nation newspaper from mid-December 1869 to about 18 March 1870 when he replaced Oscar Malmros as American Consul. See The Military/ Settlement Guard and Red River Newspaper Chronology and the men who ‘made’ the news, this site. “An army pensioner, who had taken his discharge from the Royal Canadian Regiment when they left Fort Garry in 1861”; owners/ proprietors of Devlin’s, a restaurant and hotel. See Isaac Cowie, Company of Adventures (1913), 155; reference in advertisement New Nation (21 January 1870); and George F. Reynolds, “The man who created Portage and Main,” http://www.mhs.mb.ca/docs/transactions/3/portageandmain.shtml. Dan worked as a clerk at Bannatyne and Begg’s store. See Isaac Cowie, Company of Adventurers, 155. The sisters held voting privileges, see Consideration of the political position of Women during the Resistance, this site. – Elisa 13, Susan Lillian 10. Canadian Party sympathizers, see W.J. Healy, Women of Red River (1923), 82, for reference to Harriett Caussell Crowson. – [33-42] James F. 30, George P. 22, Robert P. 20, Elizabeth 18, Edward A. 16, Harriet 15, Alex 14, Mary J. 8, Agnes 6, William H. 5. See Prisoners, this site. See also W.J. Healy, Women of Red River (1923), 83, for description of one of Mulligan’s daughter’s experience while visiting her father in gaol; and “The Liquor Laws,” in “Council of Assiniboia,” Nor’-Wester (28 December 1859), for a reference to Mulligan’s early attempt to peddle liquor. – [1780-1787] (but missing 1784) Baptiste 17, Pierre 20, Francoise 13, Rosalie 11, Philomene 10, Antoine 6, Joseph 5. – William 4, James C. 1. Supporters of the Provisional Government. [44-45] – Mary Jane 17, Christian C. 15. Businessman, sometime partner in the saloon ventures of John Lennon Sr. and Hugh F. Olone. – Ellen 5, J.A. 3, Mary L. 1. Opened a butcher shop by 1871. – Robert 14, James C. 12, Alex J. 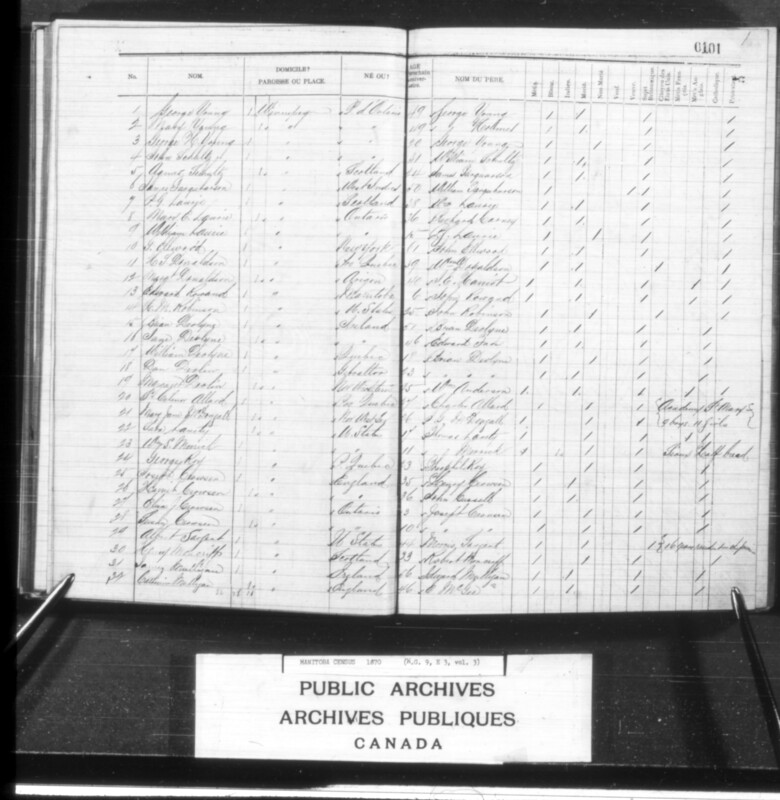 8; and  Charles Murrick 9 (Métis, born in the U.S. to Andrew Murrick and an unidentified woman). See Prisoners, this site. Related to Adams George Archibald, who was afterwards appointed the first Lieutenant Governor of Manitoba. Arrived at Red River on 10 May 1870. In September they bought George Emmerling’s hotel and renamed it Davis House. See Prisoners, this site. James and Joseph Devlin became managers of The Garret House, a bar and boarding house owned by distiller Charles Garret. See advertisement, Manitoba News-Letter (19 October 1870). – Pierre Daniel 8, George Philias 6, Alexander Robert 4, Victor Aristide 3, William Romain 2, Elzear Joseph 1. Businessman and horse fancier in the Town of Winnipeg — best known as a saloon keeper. See “Sporting Affairs,” New Nation (17 June 1870). He fathered Ellen Fraser’s child, John Lennon Jr. (see below), but seems to have deserted Red River in the summer of 1870 — the last advertisement for his saloon appeared in the 30 July edition of the New Nation. John Lennon has been confused in some histories with Edward Lennon who arrived at Winnipeg in 1871 and opened the ‘Red Saloon’ with William Cosgrove. –  John Lennon Jr. 1. See Prisoners, this site. See also W.J. Healy, Women of Red River (1923), 82-83, description of Mary Ramsay Wright’s experience visiting her new husband in prison. – F.G. 9, Mary H.E. 2. On arrival at Red River worked for Mr. Holmes, a brewer in St. Boniface. Eventually Monchamp opened a bar in a small room on Post Office Street. See Begg, Ten Years in Winnipeg (1879) 12. – Christiana 17, Matilda Ann 13, Maria J. 11. Liquor distiller, operator of Garrett House, a saloon/ boarding house. Member of the Canadian Party’s Volunteer Militia (see Prisoners, this site). Described by Alexander Begg, Ten Years in Early Winnipeg (1879), 13, as “hotel-keeper, lawyer, doctor, stump orator and goodness knows what else” who “made himself notorious.” He died 1873. – James 14, Eliza 12, Roderick 10, Laura 8, William 6, Robert 3, Annie 1. No. 41. Baptiste Abraham/ Kewopetung, married to an unidentified woman. No. 52. Acsenspenais[? ], married to an unidentified woman. No. 10. Ahunasquat, married to an unidentified woman. No. 11. Ahshuhayahaik (no wife listed). No. 30. Ahpetokakeek (no description; absent?). No. 31. Ahyakakwanis, married to an unidentified woman. No. 4. Akgenehkeshewaskung, married to an unidentified woman. No. 95. Anekapeneesekapowak[?] (no husband listed). No. 2. Aniaweshohkempk, married to an unidentified woman. No. 90. Antoine, married to an unidentified woman. No. 94. Assaweepennis, married to an unidentified woman. – 3 sons, 1 daughter. No. 65. Assenspenaissik (no husband listed). No. 126. Ayahkookaynayas, married to two unidentified women. No. 96. Aysance (no husband listed). No. 89. Chakaahsee, married to an unidentified woman. No. 71. Charles, married to an unidentified woman. No. 27. Ekwahwehkeepeekook (no description; absent?). No. 12. Foasasis[? ], married to an unidentified woman. No. 40. Fohpahsaheek (no description; absent?). No.16. Hahsenekahmek[? ], married to an unidentified woman. No. 42. Paschal Indian, married to an unidentified woman. No. 47. Ingebown (no description; absent?). No. 15. Kahkaykeegik[? ], married to an unidentified woman. – 4 sons, 3 daughters. No. 104. Kahkaypet[? ], married to an unidentified woman. No. 103. Kahkeepaykakpoweek (no husband listed). No. 48. Kahkekepenais, married to an unidentified woman. No. 98. Kahkeweepenussik[? ], married to an unidentified woman. No. 127. Kahnaymeepenaisik (no husband listed). No. 7. Kahpakakneekook (no husband listed). No. 100. Kahpayahnaquahook (no husband listed). No. 102. Kahpaykahpow (no husband listed). No. 101. Kahpaytahkoos[? ], married to an unidentified woman. No. 32. Kahsekohkanse, married to an unidentified woman. No. 54. Kahtwnoonuk[?] (no description; absent?). No. 97. Kahwayekahpow[? ], married to an unidentified woman. No. 29. Kakeenekapow[?] (no wife listed). No. 6. Kapahahsasing[? ], married to an unidentified woman. No. 13. Kapayahpanting, married to an unidentified woman. No. 60. Kapayasaykik (no husband listed). No. 86. Kapayashmahnook[?] (no husband listed). No. 23. Kechekapeemahenung[? ], married to an unidentified woman. No. 25. Eliza Kennedy (no husband listed). No. 81. Manaskakwakouep[? ], married to an unidentified woman. No. 26. Manitooshick (no description; absent?). No. 53. Manoqnapeapas[?] (no description; absent?). No. 82. Maysayaseekay, married to an unidentified woman. No. 124. Meeshakeekeenoo, married to an unidentified woman. No. 8. Mesqnanik[? ], married to an unidentified woman. No. 17. Miskakeenos[? ], married to an unidentified woman. No. 43. Mistik. (no description; absent?). No. 49. Misqnagewape[?] (no description; absent?). No. 9. Nabawash, married to an unidentified woman. – 4 sons, 6 daughters. No. 107. Nahtahmukaykot[? ], married to an unidentified woman. No. 109. Nanoondahkooggeek (no husband listed). – 2 boys, 2 girls. No. 28. Naohkeeseequak, married to an unidentified woman. No. 1. Nashakepenais, married to an unidentified woman. No. 108. Neepechay Kahpaywat[? ], married to an unidentified woman. No. 110. Neeshkeegeekook (no husband listed). No. 46. Neshwaysik (no description; absent?). No. 5. Newashekeejek[? ], married to an unidentified woman. No. 55. Noweguosh[? ], married to an unidentified woman. No. 73. Ogayquahoweemenin, married to an unidentified woman. No. 21. Okeymahkopmeek[?] (no husband listed). No. 62. Okeymahweemsi[?] (no description; absent?). No. 112. Okeypaygeek (no wife listed). No. 114. Ookahpayahseek (no husband listed). No. 115. Oomeenwahkeegeekkook (no husband listed). No. 113. Ooshanemekeykook (no husband listed). No. 57. Oozouwaskookenyass, married to an unidentified woman. No.38. Oshahwopenais, married to an unidentified woman. No. 111. Osheekook (no husband listed). No. 76. Oshequana[?] (no description; absent?). No. 88. Osoyogeegik (no wife listed). No. 118. Pahmeegaygeek, married to an unidentified woman. No. 50. Pahpahschooch (no description; absent?). No. 117. Pahpayshseek, married to an unidentified woman. No. 77. Papahqueenay, married to an unidentified woman. No. 129. (wife of) Paygeekkaygik (but no husband listed). No. 83. Payshanaquatape, married to an unidentified woman. No. 116. Pehaweekeegeekook (no husband listed). No. 91. Pekahweetanook[?] (no wife listed). No. 74. Penaisseahnaquat (no description; absent?). No. 67. Penaissecaumhook[?] (no husband listed). No. 92. Penaissewahnahquah[? ], married to an unidentified woman. No. 45. Sahkahkeek (no description; absent?). No. 59. Sakatchewayaskung, married to an unidentified woman. No. 22. Sakeemee (no husband listed). No. 78. Sanywaywayununusay[?] (no wife listed). No. 64. Shamenowan (no wife listed). No. 36. Shasayanse (no husband listed). No. 80. Shaycenous[? ], married to an unidentified woman. No. 120. Sheenaweekeegeekook[?] (no husband listed). No. 123. Sheshekewainse (no wife listed). No. 119. Shumahwahpeek[?] (no husband listed). No. 84. Sooskokaybay[? ], married to an unidentified woman. No. 79. Sugepenais (no description; absent?). No. 68. Tagamis (no description; “absent”). No. 70. Tahhiskotaygeekeeseenin[?] (no description; absent?). No. 75. Tahtouise (no description; absent?). No. 87. Takaywaysanze, married to an unidentified woman. No. 61. Takooah ah sik[?] (no husband listed). No. 93. Ta pa say sick (widow). No. 72. Tatahkaygeequap[?] (no description; absent?). No. 121. Taytahpeesask, married to an unidentified woman. No. 24. Uachekewis[? ; first letter should be M? ], married to an unidentified woman. No. 35. Uahsahwaskwaniue[? ; first letter should be M? ], married to an unidentified woman. No. 37. Uamloopenais[? ; first letter should be M?] (no wife listed). No. 20. Uanitoowahpes[? ; first letter should be M?] (no husband listed). No. 34. Ueemahskekapow[? ; first letter should be M? ], married to an unidentified woman. No. 105. Ueeshakeeyanahquat[? ; first letter should be M?] (no wife listed). No. 3. Uesheequeeqnan[? ; first letter should be M? ], married to an unidentified woman. – 2 son, 1 daughter. No. 106. Uukoskosnayak[? ; first letter should be M?] (no husband listed). – 6 sons, 1 daughter. No. 18. Wahcheekamung (no description; absent?). No. 66. Wahkaykonaypeek (no husband listed). No. 125. Wahsahkaygeek, married to an unidentified woman. No. 122. Wahyahsookquaywakeek[?] (no husband listed). No. 19. Wankaygeekook, married to two unidentified women. No. 39. Wahshahwaskookshpow, married to an unidentified woman. No. 63. Wahwegeskopowuk[?] (no husband listed). No. 69. Wendabebung[? ], married to an unidentified woman.